Social Enterprise and the Circular Economy - MW Capital Management Pte Ltd.
Social Enterprise and the Circular Economy – perhaps the two most important areas to focus on in the next decade. We live in a world where the gap between the haves and the have-nots has perhaps never been wider. 10% percent of the world’s population live on less than USD1.9 a day. Similarly, nearly half the world’s population live on less than USD5.50 per day (source: Worldbank). The same that you may spend on a coffee in the morning. We will always have an income or wealth gap. It goes without saying that those who put in the hours and effort should receive greater compensation and income that those that don’t. But we need to also ensure that the playing field is a little more level than it is today. The alternative will be increasing ‘terrorism’, unrest and social discord, at the international and national level. Social enterprise, not charity, is the way to get there. Charity in our view has had its days. Giving money to those in need is applaudable, but teaching or investing in those in need, to provide a service from which they can make a living, employ others and build a society, is far more valuable. When somebody gets something for nothing, it is often not appreciated. It is used up, squandered and usually the recipient goes back asking for more. Sometimes handouts even lead to a real dependency that wasn’t there in the first place. When a system is in place whereby an individual that demonstrates a work ethic, tenacity, capability and entrepreneurship, gets rewarded for those efforts with training or investment, the return is likely to be that much greater. Particularly when it is given on the expectation that the business should be profitable and should be able to grow and expand to hire others. Also, that the money can be repaid and recycled to another value adding budding entrepreneur. A government or institution that builds houses and facilities for free, will engender reliance and will create a populous that has a focus on ‘working the system’, rather than investing the time and effort to creating economic growth for all. It becomes a society of takers, not givers. There are many examples of this and how it eventually leads to failure. Those who become ‘takers’, lose their pride. They have no vested interest in what has been given to them. In the social enterprise model, nothing is given away for free. It has to be worked for and earned. 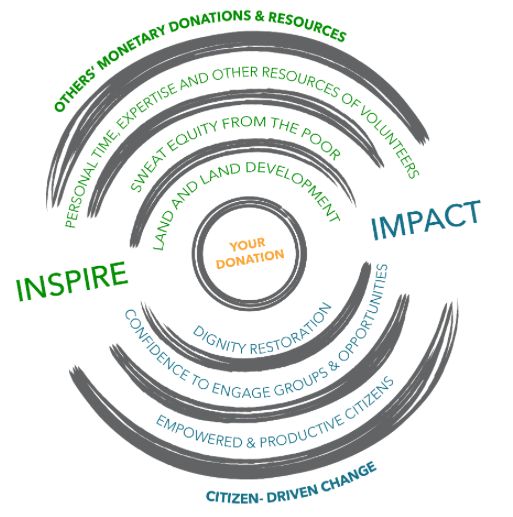 This model of having to work your way out of poverty has been used to good effect by Gawad Kalinga (GK) in the Philippines, founded by Tony Meloto. Gawad Kalinga continues to rally all sectors of society to help achieve its vision to end poverty for 5 million families by year 2024. They started off by assisting the poor to get a roof over their heads. They didn’t build houses for the poor though. GK organized and empowered the poor to build their own homes. Of course, there were tons of assistance and donations in kind – supplies, land, money etc – but is was those poor that were being helped that built their own, and their neighbor’s, homes. 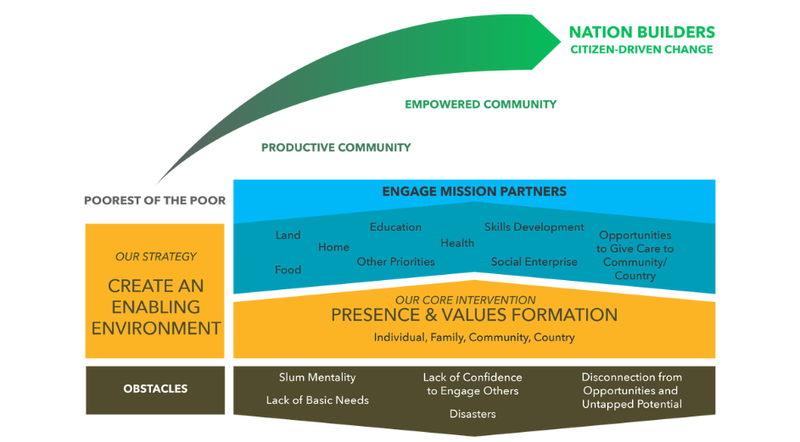 With “padugo” (bleeding for the cause”) and “bayanihan” (being a hero for one another) as their guiding principles, the multiplier effect becomes inherent in the GK model. Nobody could move in before each and every home was complete. In villages where this has been done, there is no longer poverty and there is no crime. The criminal often becomes the village security officer! Nobody wants to cause unrest in a place they have helped build. 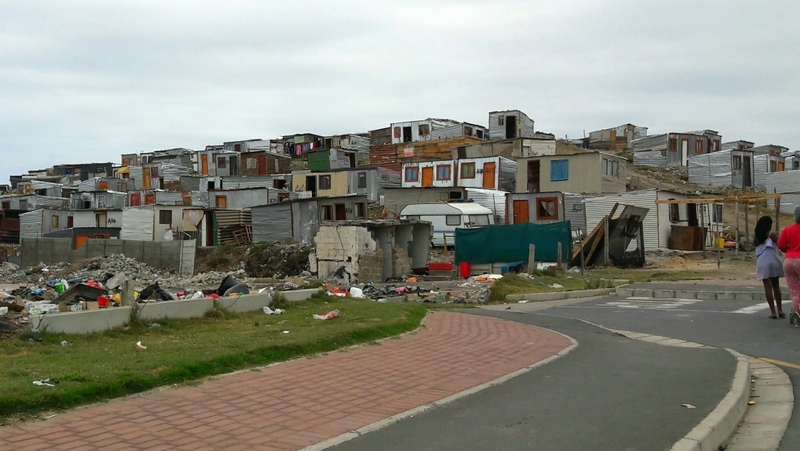 The village regains its pride and dignity, key building blocks to transform a disadvantaged group in Society. In one of their villages they created a model of social enterprise that could be copied and applied in many other developing nations. It is known as the Enchanted Farm. It is filled with small time entrepreneurs and has become an ecosystem of international MBA students, volunteers and local and international entrepreneurs. The concept is slowly being replicated in other parts of the world, such as Malaysia. I have written about the place many times and it is an excellent example of how social enterprise can work – click here for article. The businesses can get assistance and can tap into the GK network on the basis that they are producing something of economic, or social, benefit and they will, in time, become profitable and able to employ others, thus spreading economic benefit. A dollar allocated to fund social enterprises, will go a lot further than one given as charity. Based on estimates, the world cities generated 1.3 to 2 billion tonnes of waste annually with Asia accountable for 1 million tonnes per day. With current urbanisation and population growth rate, the global waste generation is estimated to rise to over 2.2 billion tonnes by 2025 (Source: Worldbank and the theworldcounts.com). Some 99% of what we buy is dumped within 6 months (Source : Theworldcounts.com). In the United States alone, 2.5 million plastic bottles every hour – about 42,000 per minute, or about 695 per second are thrown away (Source: rubiconglobal.com). 90% of solid waste does not get recycled. Landfills are among the biggest contributors to soil pollution – roughly 80% of the items buried in landfills could be recycled (Source: rubiconglobal.com). Over 11 million tons of recyclable clothing, shoes, and textiles make their way into landfills each year (Source: rubiconglobal.com). The United States throws away $11.4 billion worth of recyclable containers and packaging every year. The current linear model is flawed as pretty much everything that gets produced lands up in the trash. Indeed, the quicker it can be discarded the better, is the view of many corporates. It is not though, the corporates that suffer the consequences and costs of the linear model. It is the common man – everybody. And often it is more so the poor, as garbage gets transported to the poorer areas and countries. Indeed, what we need is a total re-think of the current linear system. If not a new system altogether, namely a circular system – a ‘borrow, use, return’ system. Take clothing for example. Did you know that the fashion sector is the second largest polluter on the planet? There are piles of clothing dumped globally in the name of fast fashion. Old lines get destroyed. Buyers use the pieces for a month, find the style has changed and deposit in the bin or in a charity box. Charity boxes are stuffed full of clothes. Not only that, but think about the resource side. Consider the resources required and used up in the production on garments, from polyester (plastic based), cotton, dies, electricity, shipping etc. Imagine though if those same fibers used could be re-used. That clothes could be picked up by the manufacture, stripped apart and re-made into the latest creation. Lower resource usage and waste. Key though is that the items being produced, from clothing to cars, tires electronics etc, are done so in a way that allows the process to be circular with the least impact on the environment. Melting plastics and old tires in the laying of roads or burning them for energy sounds like a good idea, but what about the toxins that are realized in the process and the minute particles that aren’t filtered. The circular economy is still in the vary early stages of becoming a global trend. It’s a trend that will likely go viral though, as, at the end of the day, we are increasingly living off borrowed time if we don’t do something about reducing climate change and waste. The beauty is Social Enterprises and the Circular Economy effort are symbiotic – they can leverage each other. Social Enterprises can, for example, be established around garbage collection and recycling, with pickers becoming organised and recognised as playing a significant part of the recycling process. MWCM is still a small organization of limited resources. We have though, spent the last few years building out our capabilities in terms of asset management and our performance is reflective of this. We do though, have many friends and followers that I sense would like to do more than simply generate a financial return; would like to make for a better world in their own way. In this regard, we are going to start developing our focus lists to specifically include companies and funds in the social-enterprise and sustainability space. With the intention of creating a universe of investible securities, that are best of the breed in the space. We are looking here for funds that invest in social enterprises and can demonstrate a strong track record, and companies explicitly involved in the Circular Economy. We want to hear from companies that are real champions of the cause and have been able to make being circular an advantage for them. Companies such as Interface (ticker: TILE) are noteworthy as they are truly endeavoring to be the most environmentally conscious player in their industry. So, who is with us? Who wants to make a difference? Please spread this far and wide, so we can widen our net and find the best players out there and spread the word.